I have added a new game to the AGS Games database. I say a new game because this is the first time that anyone outside my small circle of family and friends has seen it. This is, in fact, it's third incarnation – the first was completed in the 1970s. Not as a computer game, obviously! 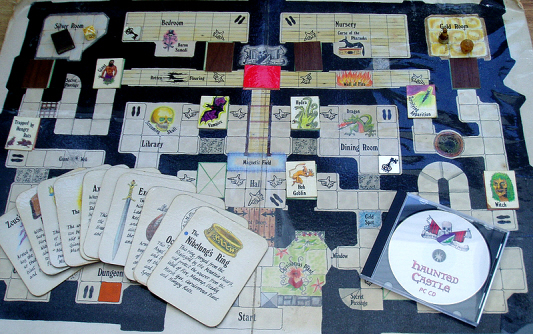 Haunted Castle was originally a board game, complete with hazard and protection cards, as well as little models of treasures that players could collect. About 12 years ago I turned Haunted Castle into a computer game for my children and their friends, using a DOS based program. I have now revamped it using AGS. It is not really an adventure game, though it does contain some elements of a quest type adventure. 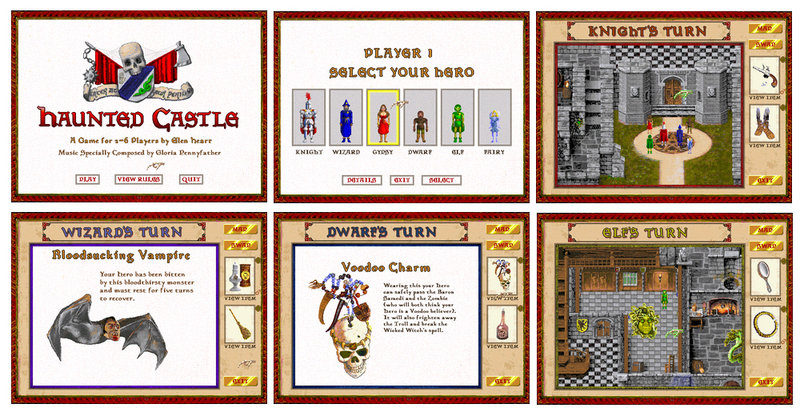 It is a turn-based game for up to six players, who have to guide their chosen characters through the Haunted Castle in a race to find a key to either the Gold or Silver Room, where they collect a treasure. Players have then to escape from the castle with their treasures, and the first one out is the winner. The six characters have different attributes to help win: the Knight wears protective armour, the Wizard can teleport, the Gypsy can foresee danger, the Dwarf can walk through walls, the Elf can run faster than the others, and the Fairy can fly. A complete game can be played in under an hour, and because most of the hazards are placed randomly on the 'board', it can be re-played as often as you wish. My children really enjoyed playing it, and it is an ideal game for a family to share. Playing computer games doesn't have to be a solitary experience! It would help if you linked directly to the download page, too. This looks perfect for some of my classes at my school around Halloween time! Thanks so much for this one elentgirl! I'll download tomorrow and check it out! Nice addictive game, and will also teach kids a bit about folklore and legends too! When I went to Map while still standing on the left-hand card spot in the first room (which was the siren) I got the warning message that I was asleep again. I wasn't...but still got the message. When I was the frog I swapped items and got the broom. My character graphic changed back to normal, but when I moved I was froggy again. Thank you for your bug report. The first one was something I had missed in my testing. If the hero is still standing on a hazard region and looks at the map he/she seems to get caught again. I have added an extra variable to stop that happening. The other bug I couldn't replicate, and I find it hard to understand as the hero's view is changed when the spell is cast and does not change back until the spell is broken. Unless it was somehow tied in with the other bug and your hero was still standing on the region where the spall was cast. If that was the case, it should have been fixed by the new variable. If you find it happening again, or any other odd events, please let me know. I have done extensive testing, but there's always something that gets missed! Version 1.1 is now available to download. Well that looks quite cool! Hope the 30-40 years of development have paid off. I would say they have actually. After a few plays now I found the six characters in the game, and all the items, and threats etc. to be very well balanced. It seems any character has a pretty much equal chance to win if the player uses that character's special abilities wisely. The game actually requires a fair bit of concentration and skill as well: The player who is able to plan out and prepare for the most advantageous route through the castle, while also remembering which particular threats lie in their path, but also remaining flexible when new paths and opportunities might pop up, will have the best chance of winning. But there is also a nice balance of chance vs skill where even the best laid plans might come undone just through rotten luck. Also, the more seasoned player will have an advantage over newcomers with the knowledge they have gained of the castle's layout. I think kids (and adults) can play this game and it will help develop in them important life-skills of planning ahead but remaining flexible within the plan's framework and not getting chained to any one particular course of action that is preventing progress. A surprisingly deep game well tweaked over many years is what I found. Looks awesome, I'm going to try this tomorrow. That was what Cogliostro meant and that way your downloads will all get counted. Thank you Khris, that is a better way of doing it. I have updated my entry accordingly.